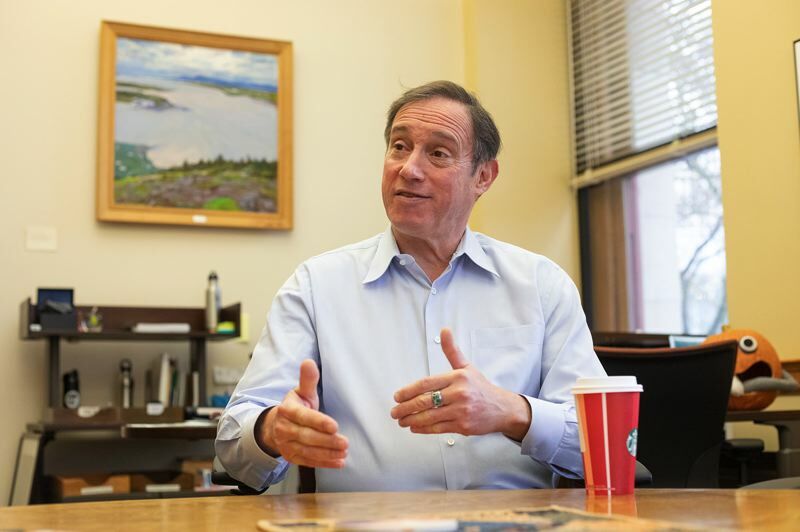 Portland Commissioner Dan Saltzman reflects on his lengthy career of public service as he prepares to leave City Hall. When Portland city Commissioner Dan Saltzman leaves office at the end of the year, the City Council will lose almost half its institutional memory. Saltzman, who did not run for reelection this year, is closing in on serving 20 years on the council, the longest tenured commissioner since 1969. Altogether, the remaining members have been on the council only around 22 years, with Mayor Ted Wheeler and Commissioner Chloe Eudaly serving only around two years each. Saltzman, who has no retirement plans except for taking up photography, admits having mixed feelings about the looming change. "It's unsettling. I'm going to go from 60 miles per hour to zero. But I'm looking forward to having an unscheduled life," Saltzman told the Portland Tribune during an interview in his City Hall office last Friday. Although Saltzman has a reputation as the most low-key member of the council, he has many accomplishments to look back on. 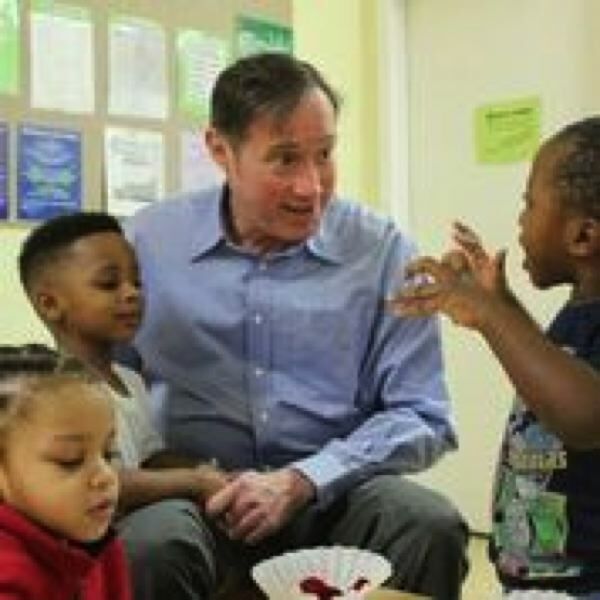 He is proudest of creating the Portland Children's Levy, a voter-approved property tax that so far has raised over $180 million for nonprofit organizations that serve children. City voters have overwhelmingly approved three consecutive levies sponsored by Saltzman and referred to the ballot by the council, funding over 70 organizations that reach more than 8,000 children and their mostly low-income families annually. "It's my legacy," says Saltzman, who headed up and raised the funds for each of the successful campaigns in favor of the measures. Winning council support for the first measure was important because it broke down an existing separation between the council and the Multnomah County Commission. An agreement formalized in Resolution A said the county was responsible for social service programs and the city was responsible for urban services, such as water and sewer systems. But Saltzman, who served on the county commission for five years before being elected to the council in 1998, always disagreed with the division and felt the city had a legitimate role to play in providing social services. "Resolution A was mostly an excuse for not getting anything done. It made it too easy to say, that's someone else's job," says Saltzman, who also supported the city and county working together to create the Joint Office of Homeless Services. Saltzman was also among the first local elected officials to embrace sustainability, creating the Office of Sustainable Development in 2000. The council eventually merged it with the Portland Planning Bureau to form the Bureau of Planning and Sustainability. Ironically, that is one of the few major bureaus Saltzman has never overseen. Saltzman has played a major and sometimes critical role in numerous other council actions over the years. He was the third and decisive vote to build the Portland Aerial Tram linking the South Waterfront to Oregon Health & Science University's facilities on Marquam Hill. That enabled construction of the new OHSU buildings along the west bank of the Willamette River, including the new Knight Cancer Institute. Saltzman was also the third and decisive vote to bring the Portland Timbers to town by agreeing to help remodel Civic Stadium, now Providence Park. Every Timbers game there has sold out, and the stadium is currently being expanded to accommodate even more fans as the team heads into the Major League Soccer championship game on Dec. 8. 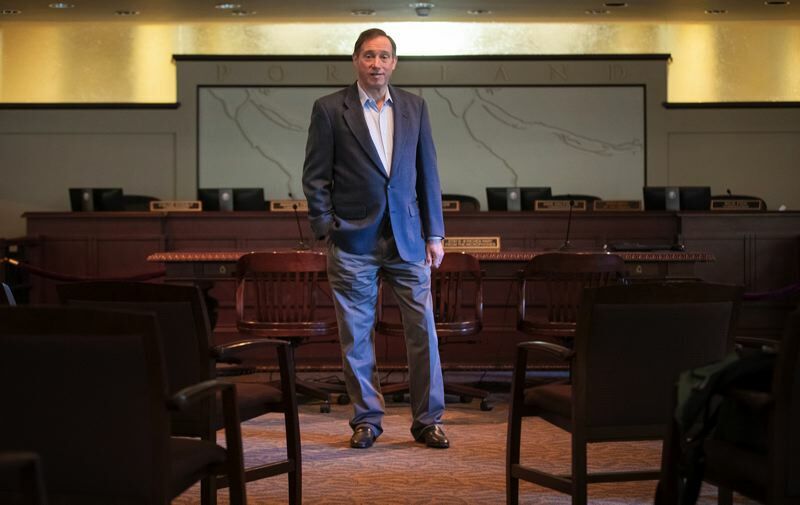 In some ways, Saltzman's 25-year public service career is as unlikely as it is successful. Born and raised in Portland, he graduated from Beaverton High School, then received a bachelor of science degree from Cornell University, and an M.S. from Massachusetts Institute of Technology in environmental engineering. He worked for the CH2M Hill engineering firm for three years before starting his own firm, Environmental Management Solutions, which he ran for 10 years. Then Saltzman shifted gears and went to work for Ron Wyden when he was first elected to Congress from Portland. That led Saltzman to run for the county commission and later the City Council, which he saw as more of a bully pulpit to champion his issues, which involve helping children and families, protecting the environment, and cutting the cost of government. Saltzman says several things inspired him to enter public service, including volunteering to help foster children. "And also, as a child, I attended Temple Beth Israel. I'm not a religious person, and many times when I was there, I was staring at the ceiling waiting for it to end. But I must have picked up something about giving back," Saltzman says. One of his first council actions was creating the Children's Receiving Center in the Gateway area, where children removed from abusive or neglectful parents by the state would go to get stabilized. He is still disappointed that Oregon cut back funding for the center when it prioritized uniting families, causing it to close. After 20 years on the council, Saltzman admits he cannot answer one of the most important questions facing the city: Is Portland's unique form of government, where council members oversee individual bureaus assigned by the mayor, a good or bad idea? The City Club of Portland and League of Women Voters are currently studying whether the city would be better served if all bureaus were overseen by a city manager, which is the norm across the country. "There are minuses and pluses," Saltzman says of the existing system. "A minus is that it's hard to get anything done if it takes more than one bureau, and council members protect their bureaus during budget sessions. A plus is, you know who's responsible for a bureau when things go right or wrong. I don't have a better idea, but any proposed change needs to come from outside this building to be credible." Saltzman has served on the council with five mayors: Vera Katz, Tom Potter, Sam Adams, Charlie Hales and Ted Wheeler. He says Katz was his favorite mayor, largely because she knew how to get things done. "She'd just make up her mind and do it," says Saltzman, who has been known to criticize how long it frequently takes for the council to decide things. One thing Saltzman won't miss is the protesters who have repeatedly disrupted council meetings over the past two years. "I understand they're upset about the election of Trump as president and the direction of the country, but they're taking their anger and frustration out on us because we're more accessible," Saltzman says. Although he is leaving City Hall at the end of the year, Saltzman is not completely done with Portland politics. He has officially discontinued his personal political action committee, but is retaining the committee he started to pass the Portland Children's Levy. Saltzman raised around $296,000 for the Campaign for Safe and Successful Children to renew the levy at this May's primary election. The committee has raised about $30,000 more since then and currently has about $53,000 in the bank. Saltzman says he will use the money to help renew the levy again in another five years, or maybe to back candidates who promise to support children. • Creating the Gateway Center for Domestic Violence, which will help serve nearly 4,000 survivors this year alone. • Securing land for Bridge Meadows in North Portland to provide quality housing for foster children, foster grandparents and adoptive families. • Finding a permanent home for alcohol and drug-free Miracles Club and building sober housing to go with it. • Securing voter approval for reforming the city Fire and Police Disability & Retirement Fund to save taxpayer dollars while still providing fair benefits to firefighters and police. • Completing the Big Pipe sewer project to help clean up the Willamette River on time and on budget as the commissioner in charge of the Bureau of Environmental Services. • Passing the $258 million affordable housing bond while in charge of the Portland Housing Bureau at the November 2016 general election. • Winning council approval of the city's Inclusionary Zoning policy to require affordable units in new residential developments. • Hiring a Portland Fire & Rescue chief, Mike Myers, who shares his vision of turning the city's 30 fire stations into centers for community health.